I’m breaking my three-weekly posting cycle to speak out against the city council’s attempts to remove decorative ironwork from one of the city’s conservation areas. “Several surviving cast iron railings along Clarendon Road are particularly fine and rare examples of once common Victorian ironwork”. Now, without consultation, the city council wants to replace these bollards to make the alleyway accessible to its mechanical sweepers. There must be a way to preserve them. 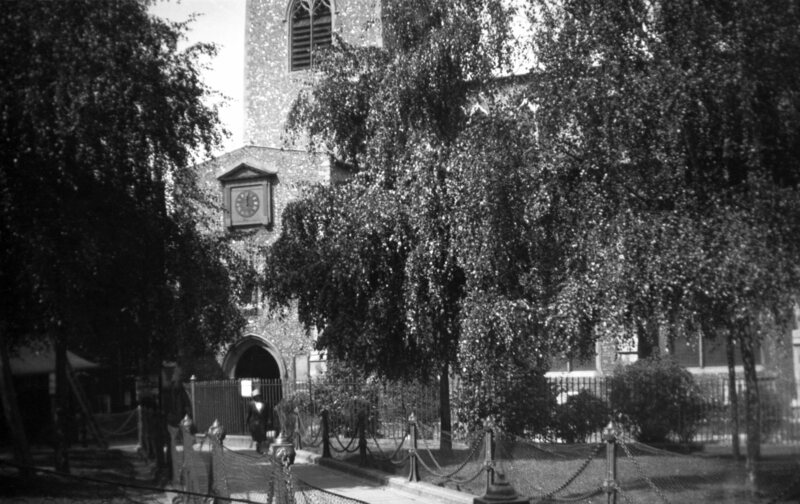 One argument for their removal is that the bollards are no older than the 1980s but the George Plunkett archive of historic Norwich clearly shows the same type of cast-iron bollard around the green outside St Gregory’s Church in 1931. So the pattern is at least 85 years old and almost certainly Victorian. … and at other historically-sensitive sites, such as the steps from the market to St Peter Mancroft, the area around Bishop Bridge and steps between Davey Place and the Castle. This design is much more in keeping with these historical sites than the hollow-cast replacements. Why this matters Norwich is a fine city, not just because of its shopping malls, but because of the incredibly rich heritage that confronts visitors at every turn. It is the historical texture of the place – what John Litster of the Norwich Society calls ‘patina’ – that visitors find so rewarding. But we have to fight for it. Remember, it was only the casting vote of the mayor in 1924 that prevented our major tourist attraction – Elm Hill – from being demolished. The council meets to discuss the Clarendon bollards early next week so please act now. What happened to the posts and railings alondside the original slope leading up to the castle from the cattle market? They were removed when the castle mall was built. It would be good to replace them, of course, but I suspect they were long ago sold for scrap. In more enlightened times the council commissioned local artist Oliver Creed to design 21 moulded tops to go on top of the red (and non-Victorian) bollards around the Norwich Lanes. If bollards are thought to be things of beauty in the city why can’t historic cast-iron bollards be appreciated just outside the city walls? I’m not up to date with the controversy about the bollards, and am not sure if you saw the letter Councillor Andrew Boswell which was published in the EDP on 12th September. It ought to be possible to trace when the bollards were put up as the streets were only built when Timothy Steward’s estate was sold in the 1880s and Grove Street north and south were built. Neville street was was not laid out until after 1905 although’ Neville Terrace is listed on the Jarrolds Directory of that year. By 1905 the streets themselves’ had been re-named Grove Street West had become Grosvenor Road and Grove Street North had become Bathurst Road. It’s possible that the bollards were placed to stop confusion about the name changes. Hi Rosemary, Good to have the input of a local historian. I understood that these bollards were installed to stop vehicles going down the alleyways. The Plunkett archive provides photographic evidence that this design of bollard goes back to at least 1931. These solid-cast bollards are of Victorian design and are deemed appropriate for visitor attractions like Bishop Bridge, St Peter Mancroft, the Davey Place steps etc etc. It would be a crime to replace them at such sites so why should they be dispensable anywhere else? Have signed the petition anyway! Thank you Deidre. Not too late since the fight goes on.